The Mansion is tucked away within the vast MGM Grand Hotel. It is a little haven away from the noise of the slot machines, but prices are geared to extracting cash from diners just as efficiently. The room is grand and fancily decorated, with elaborate flower displays and thick carpet. Bread appears on a vast trolley: you can choose from rosemary, gruyere brioche, rustic baguette, bacon bread, rosemary brioche, olive roll, Comte roll, petit pain, basil bread,… Rather oddly, the first selection only that you make is taken away and warmed up, but further top ups are served cold. The breads themselves are generally very good (strong 18/20) though not as good as the very finest selections that you can get in certain places in France (e.g. Veyrat, Louis XV). There are two tasting menus available at $385 and $500 per person. The Kobe beef alone costs $215, a King Crab Royale $125, to give some indication of price. The wine list stretches to 34 pages, very firmly at the luxurious end of the market. Examples include Ridge Montebello 2002 at $375 for a wine that costs about $100 retail, Jermann Vintage Tunina 2005 $165 for a wine costing about $40, and Kistler Vine Hill 2005 at $325 for a wine that you can buy for about $130. Incredibly, when I asked the sommelier for a “good value” suggestion, he suggested the Kistler, at a mere $325. I guess by the standards of this list, it is good value. Artichoke veloute with white truffles had good flavour intensity, and a generous helping of truffles (17/20). An ice sphere of coriander with beetroot gazpacho was pretty and had excellent beetroot gazpacho, bursting with flavour. 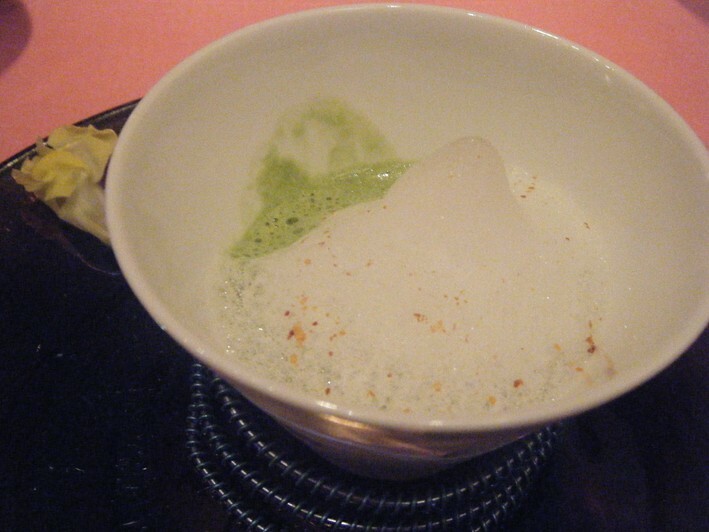 However the ice sphere of coriander tasted hardly at all of coriander, so it essentially acted as just a large lump of ice in the gazpacho (16/20). Potato salad with white truffle and foie gras was, for me, the best dish of the night. The potato had excellent flavour and went really well with the truffles and foie gras, which was served with slivers of radish and baby lettuce (19/20). Veloute of lettuce with sweet onion foam had a few cubes of ham to add an extra smoky taste, and had quite distinct flavour, but here is perhaps a limit to how exciting this dish could ever be (17/20). Oven roasted turbot with celery and celeriac was disappointing, the fish tasting bland, and even the celeriac (a strong flavour) not really lifting the dish. An issue here is that the turbot is so far from its home in Brittany, and so is frozen; inevitably some flavour is lost. Our waiter mentioned that some restaurants in Las Vegas go to the trouble of importing their fish fresh from as far as France, but that they did not do that here since it was “really expensive”. Hmm – just what does he think the menu prices here are? Kobe beef was, very unusually in America, supposedly true Kobe beef imported from Japan and not some waygu beef look-alike bred in the US or Australia. 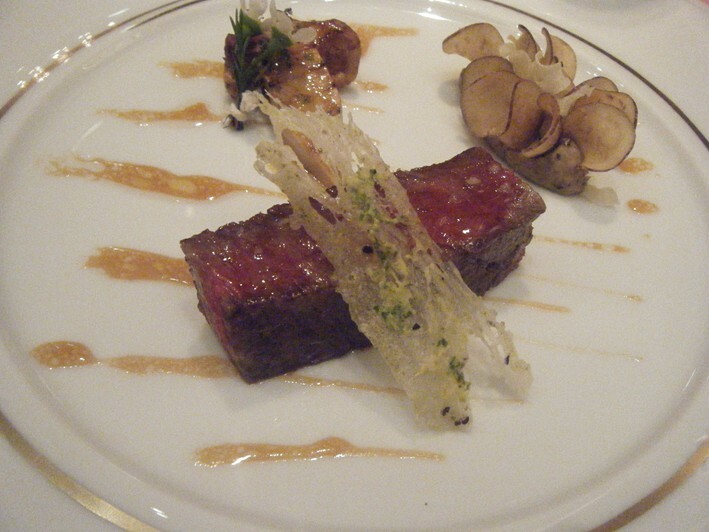 The beef was very good indeed; its marbling of fat creating the buttey smoothness that Kobe beef is famous for. This was served with a single cep (which actually was a little dried out) and a good aubergine puree, as well as an aubergine crisp (17/20). At this point my wife had sea bass with five spice and a red wine sauce, and again the fish suffered from not having very good flavour; the freezing process made what was undoubtedly a fine piece of bass originally taste very ordinary; it also seemed a little overcooked (15/20). Dessert was grapefruit with caramel sauce, and a jelly of rosé champagne. There was also a financier of raspberries with brown butter: all very pleasant but for me only 16/20 level. 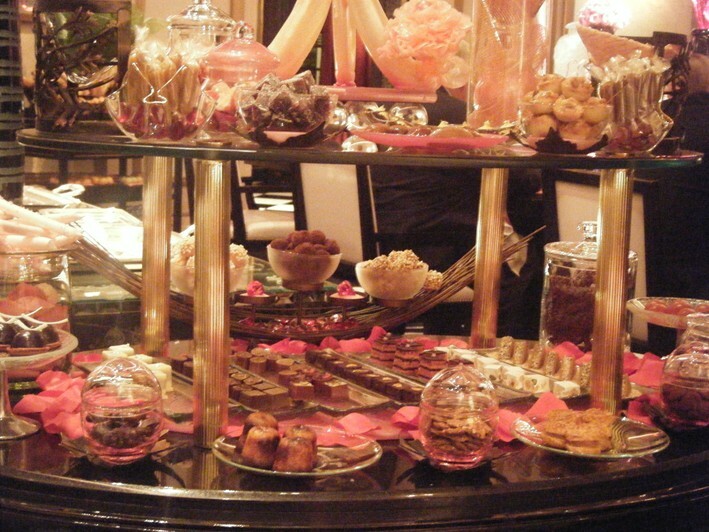 There was an impressive trolley of petit fours with a wide selection of treats. Examples were a palet d’or, opera, macaroons, etc – these were very fine (19/20). The bill was $835 for two, with one of the cheaper wines on the list. Overall the food certainly had high points, such as the potato salad and the beef, but also worrying lapses, such as the sea bass. This is inexcusable at this price. 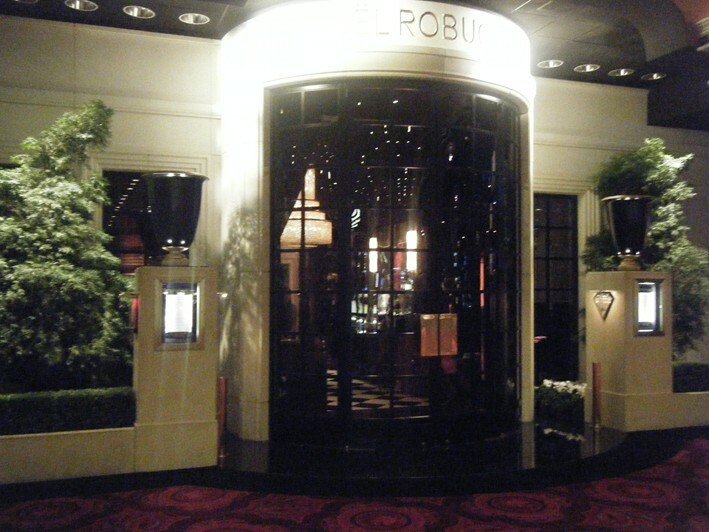 My wife & I dined at Robouchon on April 1 and selected the 17 course Menu Degustation. Based upon our experiences, the food and environment were very good ... memorable courses were the first serving of caviar atop king crab (pure artwork), Scottish Salmon, carmelized Black cod, ribeye with pomme purée, papillon dessert, and petite fours cart. Service was typically good, but had some very strange moments ... Champagne was never offered at the beginning of the meal we had to ask, as previously noted the issue of warming bread & still water was odd, a finished plate was taken from my wife while I was still eating ... I hate this, I did not like the serving of up to three courses at the same time, but I assume this is what Vegas requires, as opposed to a more standard Michelin experience, and in my opinion the price of the meal could have supported a world class cheese cart. My benchmarks for greatness includes Rochat, Rollinger, Veyrat, Troisgros, and Pic among others ... some of the food was close, but the service was far, far away. My wife and I did the $495 per person "16" course tasting menu last week. After starting off with martinis, we kept the wine costs down with only a bottle of LeFlaive P.M. and a half of Duckhorn Merlot. Service was superb, each dish was picture perfect in delivery and presentation. I agree, that the only better bread selection I have seen was at Louis XV at the Hotel d'Paris in Monaco. And yes, why only the first selection was warmed was a mystery to me, that I mentioned to my wife at the time. Yes, I think this restaurant deserves the three M stars it currently has - it is right up there with Auberge d'll, Pic, and Daniel. My only complaint was when they asked about water - the question was "still or sparkling? ", normally in Vegas the question is what type of water do you desire - with the implication that if you go with bottled there will be a charge - in this case, with only still or sparkling the expectation was that the water was included in the price - not as it turned out, billed separately at ten bucks a bottle. A minor thing - but annoying to find out, right when the bill is presented and one is calculating the tip to leave. Seemed kind of a dumb way to get an extra ten bucks per table at these prices. But, overall - would I go back - absolutely. Wow. American excess at it's finest (or worst, depending on one's perspective...). I completely agree on your overall 7/10 with the food. A couple dishes were spectacular (roasted lobster and foie gras in cabbage) but overall things were just consistently above average. I would also agree with Michelin's three stars in 2009 as "worth a special journey" but in this case not really for the cuisine but more as a case report on how silly this game can get: wine pairing options at $595, $995, and $1295! Over twenty options for your petit fours! More bread options than courses in the menu! The wait staff and sommelier were excellent, very friendly, and completely accommodating. The experience itself was very memorable but I probably won't be back until the S&P 500 hits a new high. 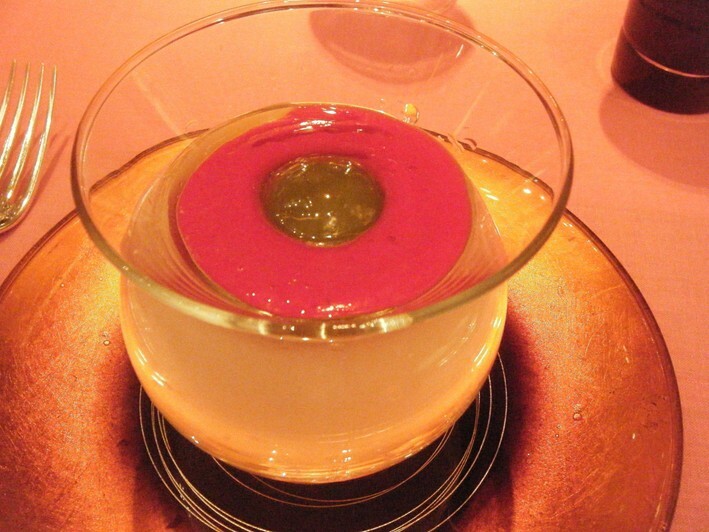 I was at Robuchon last October. I was with a friend out on a guys weekend, so we were hungy and ready for a great meal. We were not disapointed. 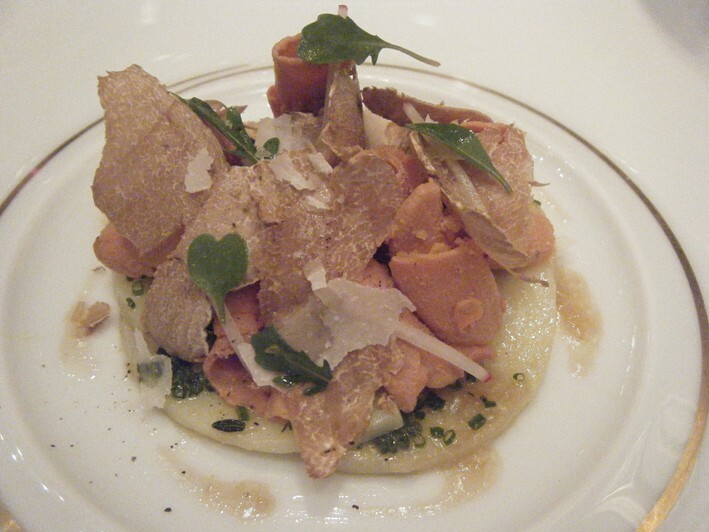 I had the white truffle dinner,which had white truffles in every dish. I cant go into all the details, as the meal was quite some time ago, however I do espcially remember the phesant and foie gras entree, which was served warm with a very subtle sorrel sauce. Excellent!!! We splurged on some Krug and a bottle of Burgandy, so our bill was around $2200 for the 2 of us!, I would do it again with pleasure.